A few months ago, Dice announced the Community Map Project, through which they created a map with the help of the community along the way. The end result is called Operation Outbreak, and it's going to be available, for free, in the nebulous season that is "Fall 2015". I went back to old blog posts to see what kind of contributions the Battlefield 4 community were able to have in the creation of this map. One early udpate has the creative director telling fans that they can't have the urban setting they want because it doesn't work with their "High Level Framework". Rural it is. Then there's a poll that allowed respondents to choose between jungle, desert, and mountain. Clearly they chose jungle, because Operation Outbreak takes place in a "dense jungle" with such features as "a medical research facility, an ancient temple, and a lush waterfall". 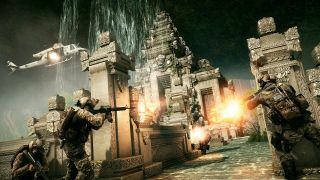 If you've ever wanted to play Battlefield in the world of Uncharted, I guess this is your chance.